Following your favorite NEC athlete or sportswriter on Twitter is an enjoyable experience, but can also become an overwhelming one. With so many people to follow and so much information to digest, it isn’t always easy to manage. Hence, the Overtime! Blog’s Twitter Take Five, a new weekly feature that selects five of the most intriguing/significant Tweets from across the NEC and presents them to our fans right here on the Official Blog of the Northeast Conference. This tweet should be an instant favorite for #NECFB fans. Thanks to Drew for sharing this awesome shot of three former #NECFB studs after the Bills vs. Redskins NFL preseason game. Smith, a first team all-NEC tailback in 2012, is one of the latest to join the list of NEC alumni in the NFL. Fellow Buffalo Bill Chris Hogan has been on that list for a couple of years now, while his old Monmouth teammate Jose Gumbs is wrapping up his second NFL Training Camp. Gumbs, now a defensive back for the Redskins, was the 2009 NEC Defensive Player of the Year. It looks like someone is excited that Bryant recently added former Boston College head coach Al Skinner to its men’s basketball coaching staff. This sports law guru gave the @NECcommish a plug this week for a recent interview she gave. In her fourth year as Northeast Conference Commissioner, Noreen Morris will again serve as Chair of the NCAA Leadership Council. This sophomore swimmer knows that there is no such thing as an easy road to an NEC championship. The Red Flash have won four straight NEC swimming titles and the perseverance that Dieterich tweets about helped make it possible. It’s the first time in five years that Velton Jones isn’t going through preseason workouts with Andy Toole’s Robert Morris Colonials. The former all-NEC guard exhausted his eligibility this past spring, but will not soon be forgotten by #NECMBB fans just as he hasn’t forgotten the effect his head coach had on him during his illustrious career. #ThrowbackThursday: Remember This Blue Devil? 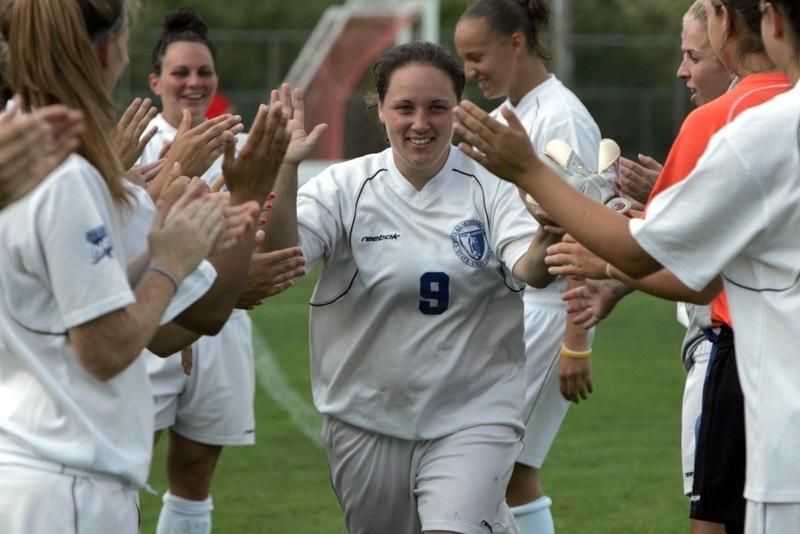 We take you back to the early 2000s with this photo of former NEC women’s soccer legend Kelly Shimmin. A two-time NEC Player of the Year (2002 and 2003), Shimmin led Central Connecticut to three consecutive conference crowns (2002, 2003, 2004). The three-time first team all-NEC selection scored both of the Blue Devils’ goals during their 2002 NEC Tournament run. Helping Central seal the “three-peat,” Shimmin recorded one goal and two assists in two games at the 2004 NEC Tournament. The Chace Athletic Center is in the process of receiving a face-lift. Actually, it may be more appropriate to call it a floor-lift. 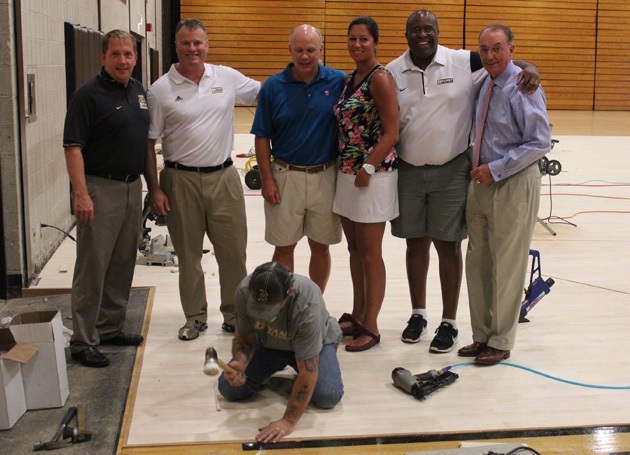 Only July 22, workers began installing a new floor at the Home of Bryant Basketball. The playing surface will be completely ready for use on September 6. Read more. CCSUBlueDevils.com is introducing a new way to tell the stories of Central Connecticut student-athletes. CCSU senior Ashley Afonso, an aspiring sports reporter, has met with dozens of student athletes and subjected each of the athletes to 60 seconds of questioning. The result is the “60 Seconds with a Blue Devil” web feature. Read more. The women already have two results in the books –a win over MAAC member Iona and a setback to Stony Brook. On August 30, it’ll be the men’s turn as Seth Roland’s squad kicks off a new campaign on the pitch at Drexel. The defending NEC champion Knights will start the season ranked No. 26 in the NSCAA/Continental Tire poll and No. 30 in the College Soccer News poll. Read more. The Blackbirds flew past Big East member Seton Hall on August 26. Now, they’ll take off for Las Vegas. LIU women’s soccer will play its third match of the season against New Mexico State at the UNLV Nike Invitational on August 30. Read more. Mount St. Mary’s hoops fans, rejoice. The season is getting closer and the Mountaineers have unveiled their 2013-14 men’s basketball slate. Jamion Christian’s team will play 12 games in front of the Mount Maniacs this season, but won’t tip off in Knott Arena until November 23. The first five contests of the Mount’s slate will all take place away from home, starting with a matchup at West Virginia on November 8. Read more. View the full slate. The first #NECFB team to take the field in 2013 will be the Colonials. Robert Morris has a Thursday night date at No. 19 Eastern Kentucky to kick off what will be legendary head coach Joe Walton’s final season on the sidelines. Although the Colonials have had the same head coach for 20 years, they do have a new quarterback. Former All-NEC selection Jeff Sinclair has graduated and Penn State transfer Paul Jones will take the snaps in Week 1. Read more. The Pioneers have aspirations of reclaiming NEC women’s volleyball supremacy, and their mission officially begins on August 30 in Worcester, MA. Rob Machan’s squad will contest the Crusader Classic and is slated to face tournament host Holy Cross in its first match. Read more. The Terriers’ 2013 soccer schedule will test Tom Giovatto’s squad right from the start. St. Francis will visit No. 5 Connecticut to kick off the new season on August 30. It’ll be the first of three consecutive road contest for the Terriers, who come home to play their first-ever game at the newly-completed Brooklyn Bridge Park at Pier 5 on September 10. Read more. Following a season-opening weekend comprised of a setback (Duquesne) and a draw (Morehead State), Saint Francis women’s soccer is bound for the Nation’s Capital. The Red Flash will play their next two in Washington DC, facing Virginia Commonwealth on August 30 before battling George Washington on Sept. 1. Read more. The Seahawks will be back to business on Hameline Field come Saturday, August 31. The 2012 NEC Football champions will welcome Georgetown to Grymes Hill, and starting center David Fredrickson is looking forward to the challenges that lie ahead on Saturday and beyond. Hear what the preseason all-NEC selection had to say when he met up with @NECralph for a Google Hangout. Read more. You can sign up the Overtime! Blog staff for a foreign summer tour through any European nation. No surprise Katie and her teammates have returned to the mainland with ear-to-ear smiles. They just took a trip of a lifetime and won all four basketball games they played across the pond to boot. Barksdale has always been a first-class individual, and here is another example. The former NFL Draft pick (2007 – Sixth Round), and current Arena Football League veteran, recently tweeted this well wish to a member of the new generation of NEC football players. Even though Barksdale’s alma mater has moved onto the Colonial Athletic Association, he will always be a part of #NECFB history. Joe Michaud already knew what it was like to win a NEC championship (he found out this past May), and now he knows how it feels to have the Top Tweet of the Week here on the Overtime! Blog. The former Bulldog is currently competing in his first season of pro ball for Oakland’s Rookie League affiliate. And, if you ask us, “Never forget where you came from” may be some of the best advice known to man. With #Kickoff2013 on the horizon, only six days away to be exact, we decided to troll Twitter and plucked one notable tweet for each of the NEC’s seven football programs. During the #NECFB Head Coaches Google Hangout, Coach Mac noted that poor fundamentals were a key culprit in the Blue Devils’ struggles last year and he and his staff would make them a point of emphasis throughout camp. Definitely going to get my Duquesne football team poster signed by @GDotCarter_2 . Best wide receiver out. Gianni Carter certainly took the NEC by storm last season after transferring from Montana State. A 2013 preseason all-NEC selection, Carter is coming off a year during which he caught 57 balls for 865 yards and seven touchdowns (all three marks ranked second in the NEC). As far as getting his autograph goes, we wish you the best of luck in that endeavor, but we’re not sure if the Dukes will be signing for local school kids after their August 31 opener against Albany on The Bluff. Rivals.com writer Andrew Chiappazzi covered Robert Morris’ scrimmage on Thursday night, exactly one week before legendary head coach Joe Walton opens his final season on the sidelines at Eastern Kentucky. With the starting quarterback position vacant following the graduation of former all-NEC signal caller Jeff Sinclair, Penn State transfer Paul Jones stepped up to earn the nod for Week 1. Starting safety Gordon Hill seems to be pretty pleased with Sacred Heart new swag. With these new unis, the Pioneers are set to look fresh when they take the field in Week 1 at Marist. The Red Flash hosted their annual preseason media luncheon on August 21 and posted plenty of images to their instagram account. Rochelle saw them. Did you? More importantly, will you be following the Flash as they open the season at six-time FCS national champion Georgia Southern on Sept. 7? It was a big final week of camp for Wagner running back Dominique Williams. First, the Preseason All-NEC selection became the first-ever three-year captain in the history of the storied program. Then, he found out that College Sports Journal tabbed him a Preseason All-American. The congratulatory tweet from former Seahawk, and current Davidson assistant coach, Frank Swart is well-deserved.